Put the Colocasia in a pressure cooker and cook for one to two whistles. Cool it and peel the skin. Cut into 1/4″ thick rounds. Add red chilli power, asafoetida powder and salt. Mix it gently. Then sprinkle corn flour and mix it thoroughly. Then sprinkle a handful of water and once again mix it well. Heat oil in a kadai and put few pieces and fry on medium flame till it turn golden yellow. Fry the remaining pieces in batches. Finally put few curry leaves in the oil and remove it immediately. 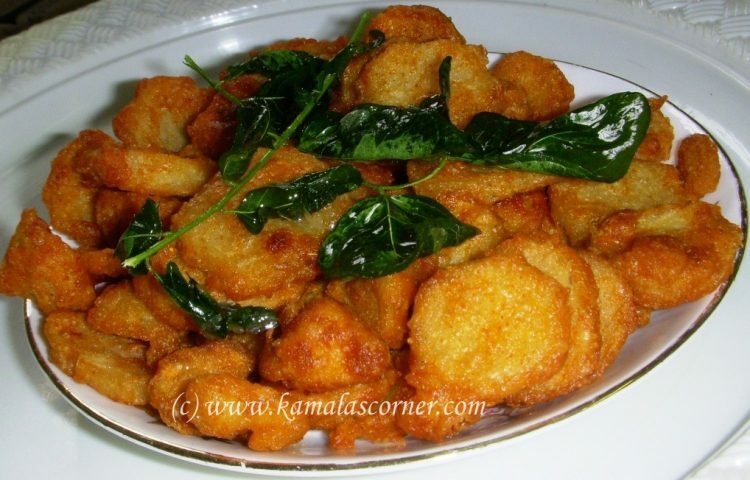 Put the fried cololasia pieces in a plate and garnish with the fried curry leaves. Goes well with sambar rice and especially with Rasam Rice. Minor correction about the spelling – it is Colocasia. Also known as Taro. The photos looks delicious 🙂 will try it out soon. Thank you Shoba for pointing out the mistake. It is a typographic error and now I corrected it. Tried this recipe yesterday. It was very good. Thank you for your feed back Shoba. instead of corn flour…any other options mam? Adding corn flour is for binding and crispiness only. Instead you can add rice flour.